I’m a few days behind on my postings due to no internet connection over the past 5 days or so. But I’ve started posting my adventures in Florence finally! Yay! Check the Expeditions page. After many months of planning and execution, the five-paneled (or pentaptych) oil painting “Northbound” is finally in its new home. The middle panel (5 feet wide x 4 feet high) and side panels (each 5 feet wide by two feet high) were specifically commissioned to fill the walls above Cornel and Patti’s newly renovated living room. Working to complete the painting alongside the construction schedule, somehow it all worked out so that the walls were not left empty for long! It was a big space to fill – the most ambitious project I have worked on to date. Through multiple meetings and discussions, the idea was slowly carved out, taking shape and changing even throughout the process to end up as the final composition it is today. One of the particular design elements was to keep the two lower side panels connected but not reliant on the one above it. Thus it could hang in the design you see above, staggered in a V-shape to occupy more wall space and break away from the square presentation, which also draws the viewer’s eye towards the middle and back out again. It is thrilling to see this epic piece in the home it was designed for. Painting in progress – it was a little more than four steps, but you get the idea! The final arrangement hanging in place. After completing the work and helping to get it mounted just right, I took a step back and realized there was just one thing missing. Sleep! Now… on to the next project! Well, here it is. A taste of what’s to come. This is my first attempt at an Italian subject. Ambitious, I know. It’s a painting I’ve donated to Golder Associates to be given away as a prize at the International Association for Impact Assessment (IAIA) Conference in Florence, April 20-23, 2015 ….. a place where science and art were born and again combine as one. A very special thanks to Cecilia A. (grazie mille! ), who lent me a photograph to use for the painting, as I have not yet seen the Duomo (Cathedral of Santa Maria del Fiore). Until then, I won’t feel worthy of painting this historic and majestic subject. Soon though. Very soon. 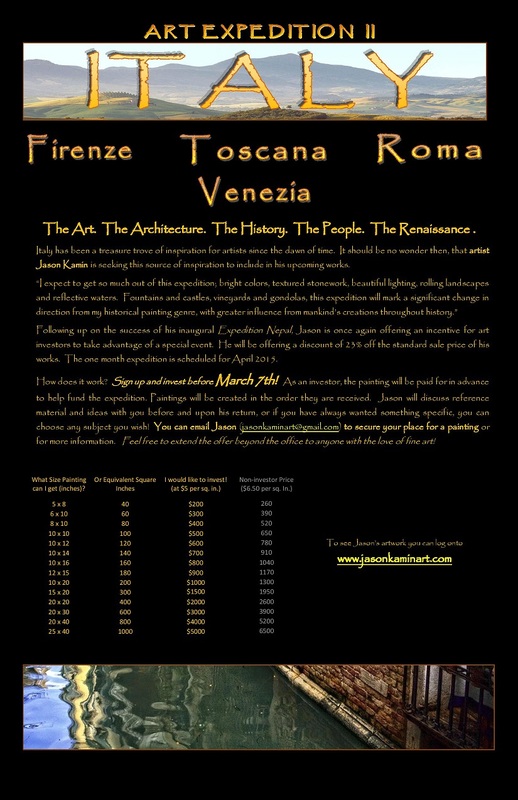 Following the inaugural Expedition Nepal in 2012, I’ll be travelling this time to Italy in April of 2015 to gather reference material in preparation for a big shift in my art style, subjects and atmosphere. It’s time to change it up. History is so rich in Italy, from the Etruscan era through Roman times, I anticipate it will be present in many of my works. The goal is to find inspiration, and pass it on in the form of a painting. The goal is to express life. Once again, I’m offering a discount, this time of 23%, to investors who would like to sign up for a painting ahead of the expedition. 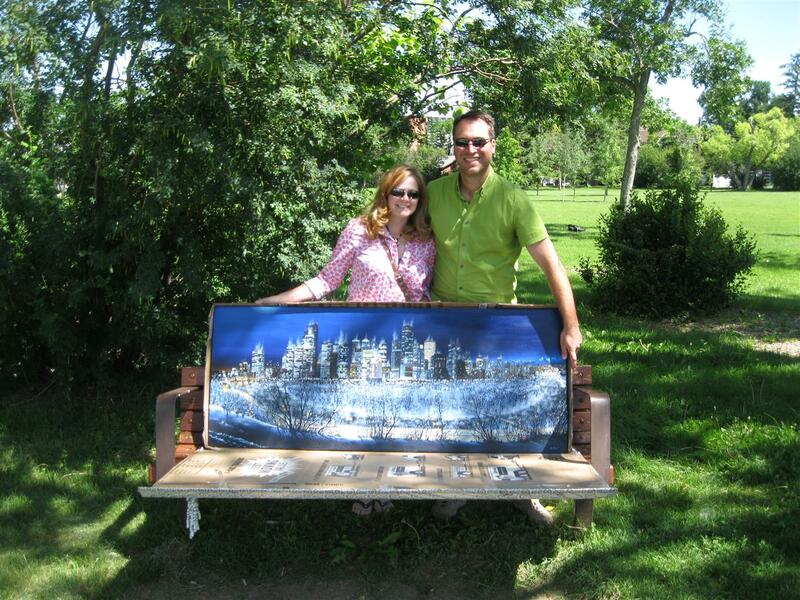 The investment will help fund the trip and ensure you receive a painting of your invested value sooner after completion. See the poster or pdf link below for more details! 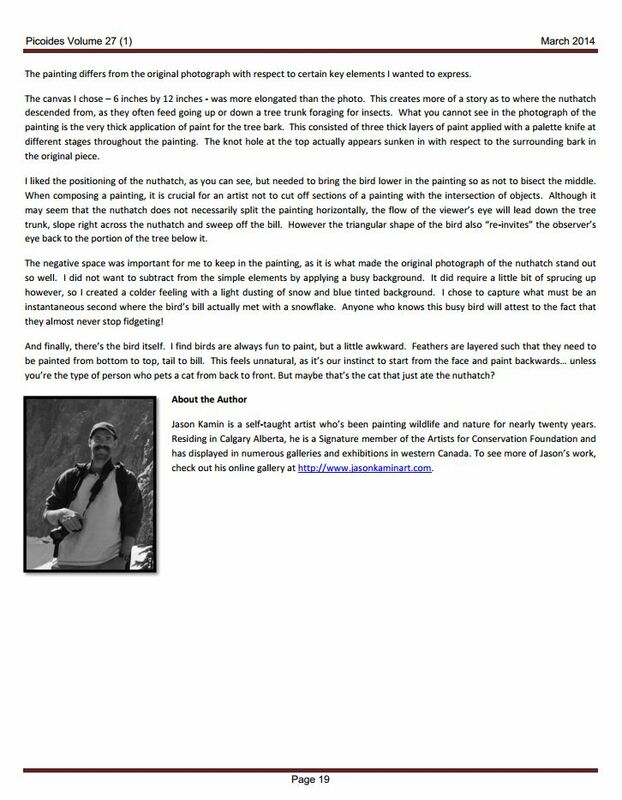 To sign up, just send me an email at jasonkaminart@gmail.com with your name, your interest in the expedition, and the amount you would like to invest for a painting. I will contact you again in March indicating the investment is due and pass along a receipt. I’ll further discuss ideas with you when I return from the expedition. I look forward to creating something you will cherish as your own or gift to someone special. To all those that have already invested – thank you! – and a wise investment indeed! 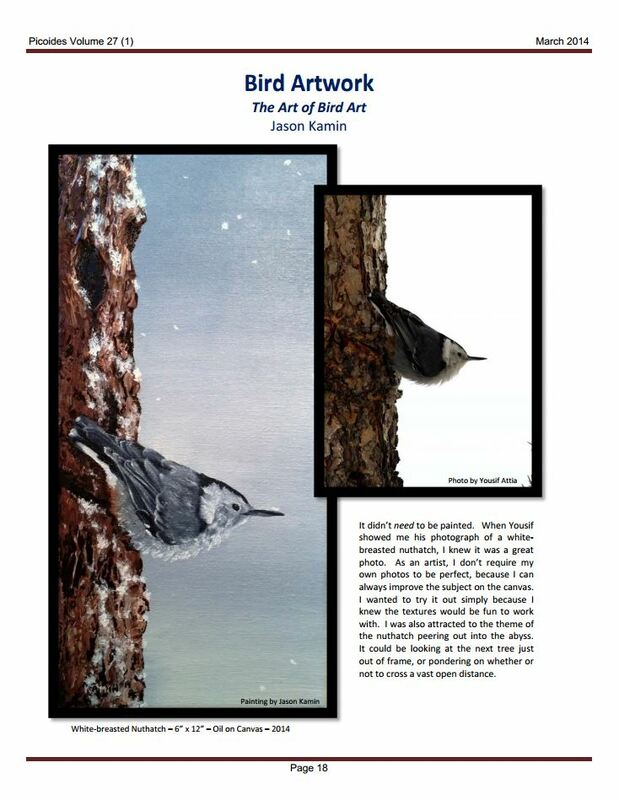 A little explanation behind the approach I take to art has been published in the March 2014 issue of Picoides; Bulletin of the Society of Canadian Ornithologists. The full article in PDF format can be found at the following link: http://www.sco-soc.ca/picoides/current.htm . Check it out! NEW PAINTINGS – Nepal Gallery Update ! 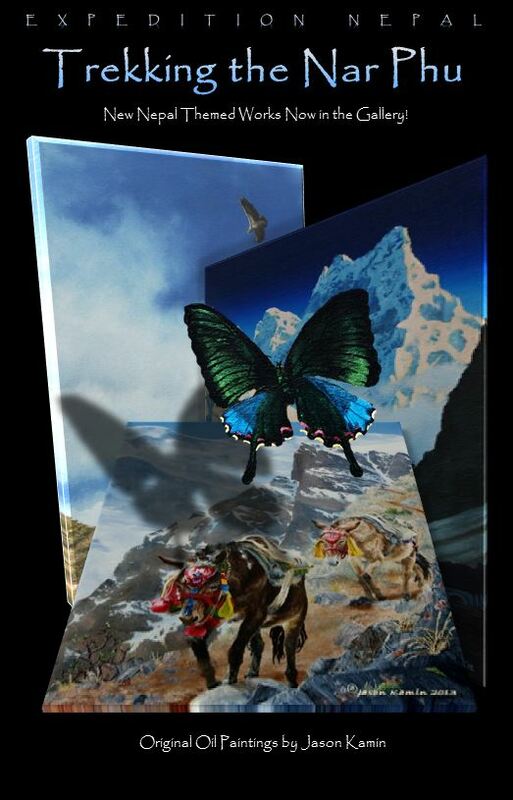 Hello art aficionados, I’m pleased to announce that the long awaited Nepal presentation of artwork to the expedition investors is now complete! Following an hour long slideshow and art display, the pieces now hang in the homes of their rightful owners. They patiently waited over a year for me to finish the 15 new works based on the expedition. Some investors chose subjects closer to home, but funded the expedition nonetheless. If it wasn’t for their foresight and wisdom (of course) of investing in my artwork prior to my expedition, it would never have happened for me. And for this, I thank them graciously! Check Out the new works in the Gallery – Nepal tab in the upper right corner of this page.